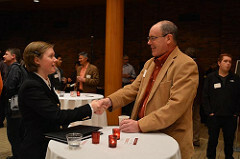 Auggie take out is a new program launched in 2018 to connect current Augsburg students with Alumni working in jobs and fields that they are interested in learning more about. After applying for the program Alumni are matched with 2 students based on major and interests. Alumni host the students for lunch at the location of the Alumni’s choosing, the students are responsible for arranging transportation to the lunch meeting. If your workplace and schedule allows the students can go back to work for a tour or some work day shadowing. Students will come prepared with questions and prepped for time spent with a professional. Ok! This sounds great, how do I apply?